It has been requested that this article be rewritten and expanded to list Silver Coin locations. Notes This track, as its name suggests, is occupied by a few whales. It also has trees. 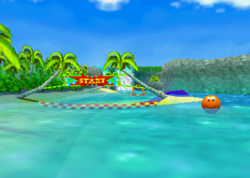 Whale Bay is the first race course of Sherbet Island in Diddy Kong Racing and its remake, Diddy Kong Racing DS. 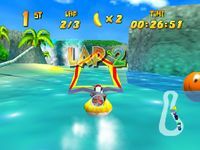 Players can only race in the course using Hovercrafts. The track begins with a boost panel to the right and a u-turn to the left. On the outer part, players can drive behind a waterfall and collect bananas. In the inner part of the turn, there are Item Balloons of each color. After this, there is a long straightaway with a dash panel to the left. Players can access the top of the ship by riding on a whale. There are rainbow balloons there. Players can take the normal path, which curves to the left. Along the way, there are red and green balloons. On the outer edge, a dash panel can be taken, and players can collect bananas along the edge. After a sharp turn to the left (with a blue balloon on the left), players advance to the complete the lap. Most of this course is done on water, but very small islands are scattered around with Weapon Balloons on them. In the Nintendo DS remake, the beginning part of the track is under a cave. The original version does not have anything in this area, and so the player may skip it. It also seems to be more difficult to get on the top of the wrecked ship, as the whales appear to be smaller. This page was last edited on February 10, 2019, at 22:55.